Some natural resources are finite and cannot be replaced. In the human body, the same could be said about cartilage, as it does not normally regrow or repair itself after injury. However, thanks to modern medicine in Los Angeles and a state-of-the-art surgical technique known as Autologous Chondrocyte Implantation, or ACI surgery, cartilage can now be re-grown to resurface what was previously irreparable damaged cartilage. Cartilage is flexible connective tissue that sometimes acts as a cushion between the bones in the body’s joints. When cartilage is damaged, it usually cannot repair itself as well as other parts of the body can. As a result, patients in Los Angeles with multiple knee injuries might find themselves with seriously damaged and reduced cartilage in their injured joints. This can cause chronic pain, and it severely limits the ability to perform the daily tasks that many of us take for granted. Autologous Chondrocyte Implantation (ACI) is a surgical technique that was developed in the 1980s, designed to help replace areas of cartilage that are missing because of injury, or wear and tear. Steven Meier, MD, director of Meier Orthopedic Sports and Regenerative Medicine, is currently one of the few orthopedic surgeons in Los Angeles that perform ACI surgery. ACI literally means “same-site cartilage cell implantation,” and it is a process involving two surgeries. 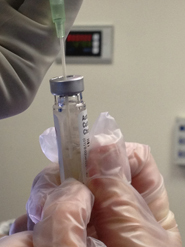 Cartilage cells are removed from the patient’s knee, cultured to grow and multiply in a lab, and then re-implanted in the area of damaged cartilage. Additionally, ACI patients must commit to undergoing a lengthy 12-month recovery process for the procedure to be a success. Not everyone qualifies, but those who do could find much-needed relief from chronic knee pain when their rehabilitation process concludes. Is Everyone a Candidate for ACI Surgery? Autologous Chondrocyte Implantation is a surgical process that requires significant effort from patients post-surgery. The recovery period is lengthy, and all patients must be prepared to undergo rigorous physical therapy during rehabilitation. If any patient is not willing or not able to commit to such a therapy, then ACI is not for them. The rehabilitation is the major determining factor as to the success of this cutting-edge cartilage restoration procedure. This is not an easy process, but the active participation and commitment of the patient to the entire surgery and physical therapy plan will be crucial to its ultimate outcome. This procedure is also only appropriate for patients with relatively small areas of cartilage damage. Patients with widespread, generalized cartilage damage or arthritis of the knee are not candidates for ACI. Dr. Meier also prefers that patients first try non-surgical treatments to help with their problem before committing to ACI. This procedure requires a large commitment by patients during rehabilitation because patients that do not perform the proper rehab will receive less than ideal results from their ACI, and may end up with more pain and less function in the affected joint due to a substandard physical therapy rehabilitation regime. Patients that are candidates for ACI will undergo two separate surgical procedures. The first part of ACI is a minimally invasive arthroscopic procedure in which the patient’s own live cartilage is harvested from the joint. Our orthopedic surgeons also use arthroscopic surgery to directly visualize the area of the cartilage damage as well as make the final determination as to whether the patient is indeed a good candidate for the procedure. After this part of the procedure, the patient’s extracted cartilage cells are shipped to a laboratory that specializes in cell expansion. There, the cells will multiply in a growing culture over a period of four to six weeks. Once enough cartilage cells have been grown (over a million), they are shipped back to the orthopedic surgeon for implantation. Next, the second surgery will take place. The second part of Autologous Chondrocyte Implantation is an open surgery, during which the newly grown cartilage is inserted back into the knee. 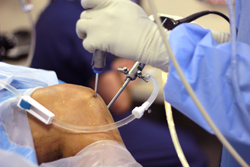 Please note that this part of the procedure is not done arthroscopically. The main incision is made over the area of the damaged cartilage within the joint so that the orthopedic surgeon can directly view it. 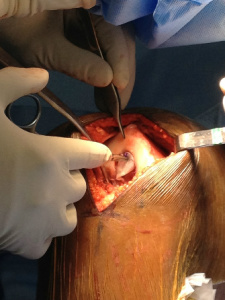 While some ACI procedures require the surgeon to harvest periosteum (the outer thin covering of bone) from part of the patient’s body to create a patch of tissue the size of the damaged cartilage, Dr. Meier in Beverly Hills typically uses a biocompatible synthetic matrix upon which the patient’s cells are coated, in order to fashion the cartilage patch during the second surgery. The tissue patch is sewn tightly over the damaged cartilage and affixed to the surrounding healthy cartilage. This will hold the new cartilage cells inside the area of the defect. Once the patch has been secured, the rest of the brand new cartilage cells are injected, in suspension form inside a special liquid, into the damaged area in order to fill it up, and the patch is secured around the edges to make sure they stay in place. The incision is sewn up, and the patient begins the long process of recovery while protecting their new, growing cells in the area that had been damaged. Rehabilitation is actually the most important aspect of ACI. In fact, Dr. Meier will not schedule any of his orthopedic patients for ACI unless they are willing to commit to at least one year of consistent, vigorous physical therapy rehabilitation exercises. During physical therapy, especially early on, weight bearing needs to be very careful, and limited, upon the area of the cartilage implant. The reason for this is to allow the brand-new cells time to properly attach themselves to the area where the procedure took place. Typically, weight bearing is limited for the first six to eight weeks before progressing over time over a period of three to six months. If the ACI includes areas located on the patella (kneecap), the range of motion must also be limited to avoid compression on the implanted cells. However, most of the time, this is not the case. Range-of-motion exercises will usually begin very early-on post-surgery. The reason that orthopedic surgeons want patients to start their range-of-motion exercises as early as possible is to stimulate the growth of healthy cartilage, and to let the body know, mechanically speaking, where the natural motion and pressure points are within the joint. This excludes those ACI procedures that took place on the kneecap. Patella-involved ACI patients might need to wait six to eight weeks before beginning their range-of-motion exercises. After about a year of ACI rehabilitation, progressing slowly from range of motion to weight bearing, to non-impact, to impact (such as jogging) exercises, patients can begin some sport-specific activities, provided they are relatively pain-free at that time. Each person’s rehabilitation course will be different, so it is important to follow your doctor’s specific instructions for each case, which vary on an individual basis. Regular checkups with your orthopedic surgeon are very important to make sure the patient is progressing well in physical therapy and allowing the surgeon to make individual recommendations on activity as necessary. You must be willing to understand that regrowing cartilage is a complicated and lengthy process, and know that each person’s experience will be different in Los Angeles. ACI surgery rehab may be a big commitment, but it is also, in many cases, the best chance for repairing and replacing damaged cartilage and returning to high levels of activity with little residual pain. If you believe you may be a candidate for Autologous Chondrocyte Implantation, please contact our Beverly Hills orthopedic surgeons. Dr. Meier and his support team are highly qualified to perform this cutting-edge procedure. Reach out and call us at 310.736.2793 to schedule an appointment for more information. Next, read about ACL Injury Treatment.